Reverse the signs of aging in one luxurious treatment! Pay as you go pricing, $99 per treatment. Package pricing as low as $79. Why Get An Oxygen Facial? After the age of 25, the skin’s normal oxygen supply decreases and skin loses up to 65% of its moisture content, resulting in a tired, dull complexion. 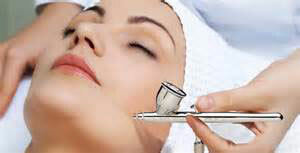 Treat yourself to an oxygen facial and put that life-giving oxygen back into your skin. The Radiant U oxygen facial gives you visible results after the first treatment. Your skin will thank you. The Radiant U oxygen facial gives new life to your skin with the addition of 90% pure oxygen, combined with a specially formulated serum that is gentle pressed into the skin – activating your skin’s own cells and collagen production. Your personal aesthetician will begin your oxygen facial with a gently cleanse, and refreshing exfoliation. Your skin is then lightly “misted” with an anti-aging serum that has a high hyaluronic acid content, in combination with either: a moisturizing extract that optimizes the oxygen at a cellular level, or a syn AKE peptide to smooth fine lines. The serum penetrates the skin by nurturing it from the inside out, while stimulating blood circulation and cell renewal.